I’m not naming names or anything, but I recently did a giveaway on a big site known for doing print book giveaways. The purpose of doing them, for the most part, is to broaden one’s reading audience in exchange for ratings and reviews. I guess that could sound a bit superficial in certain lighting, though a good review can go a long way in promotion. When the opportunity rears to offer free books for free reviews, why not? I’m the one taking the risk, since I have no guarantee that readers will like the book or review it fairly. I looked at the giveaway as a great opportunity to get my re-release into new hands, to meet people, and to get a feel for how this sort of promotion really turns out. You want to know how it turned out? Well, here’s how it started. I put a modest five copies up for grabs over 12 days. For those of you who may not know how giveaways generally work, you set the number of copies you are willing to give away and over what period of time. The organizer selects the winners then sends you their contact info, obviously including snail mails, but also their site IDs. This is a valuable little piece of information, because it means that you will always be able to find these people on this site, perhaps even “friend” them.As soon as I realized the precious info that I held, I knew I wanted to have a rapport with the winners, if they were up for it, for a few reasons. I wanted to create a relationship with them, if possible, to friend them, to notify them myself when the book would be in the mail, and I wanted them to know that I’m a real person. Of course I’m real. Why state the obvious? Because I had the down-low on what sometimes happens in book contests and giveaways. Before mine was underway, I did some research, and learned from several author friends that often people only enter giveaways to win books to re-sell. In other words, they don’t necessarily care about my book, they’re poachers. And why wouldn’t they enter? The whole thing is free for them! All they have to do is enter the giveaway and be willing to supply real contact info. The book is free, and the author pays for shipping. It’s a win-win situation for a book reseller. Dubious but still optimistic, I went with it. The giveaway ended with 469 people requesting my title–a pretty good number considering my tight parameters. The organizer sent me the names and addresses. I got my little packages ready, then I very purposefully inscribed each one with the winner’s names. Off the cuff, that sounds quite romantic and literary, but I did it for several reasons. One, so that the reader would feel kind of special. I like that sort of nuance, myself, and I’m keen on attention to detail. Also, my book is nonfiction and I meet a lot of my readers in classes that I teach, or they come to me as clients. Why not give the exchange a personal touch? Two, I put their names in them so that if my book turned up for immediate sale some place else, I would know who did it. Three, I put their names in the books so that it couldn’t be resold as new, or even with the coveted “signed by author” stamp. I’m a rockstar in my own mind, but I realize my scrawl in a cover flap doesn’t suddenly make my book a collector’s item. At this point in my career, an inscription means that the reseller can’t demand more for the book than the retail price because it’s used, and nobody wants someone else’s name in a book. One week later I found my book on eBay. The description for it was “like new,” “collectible,” and “signed inscription to…” one of the winner’s names. Who knows. Maybe the winner tore open my lovely packaging, switched off the TV, turned off the cell, read it cover to cover in one sitting, then thought, “What the heck?! This book is so great I want to make it available for someone else!” One hopes, yes? Regardless, no review came of it, not even a shelf placing, or single-click star rating. Maybe reviewing it is on the winner’s To-Do List for next week, but I’m not holding my breath. I feel really good about that last bit. I love to write but my success in it is built on forming relationships, and I like it that way. I’m glad I’ve had a chance to interact with new people, one of which is one of the other giveaway winners, who eagerly awaits reading the book and reviewing it. I know, I know. I have no control over such. It happens. It’s part of the deal. I get that. I just want to give other authors some insight into the shadows of giveaways. Do I advise doing them? Sure. Just know what you’re likely up against, and have very clear intentions for why you’re doing it, realistic expectations for the outcome. Will I do one again? Probably. Quite likely, though I will still prep the books exactly as I did this time. Besides, as my partner said, having my book listed on eBay is good SEO. 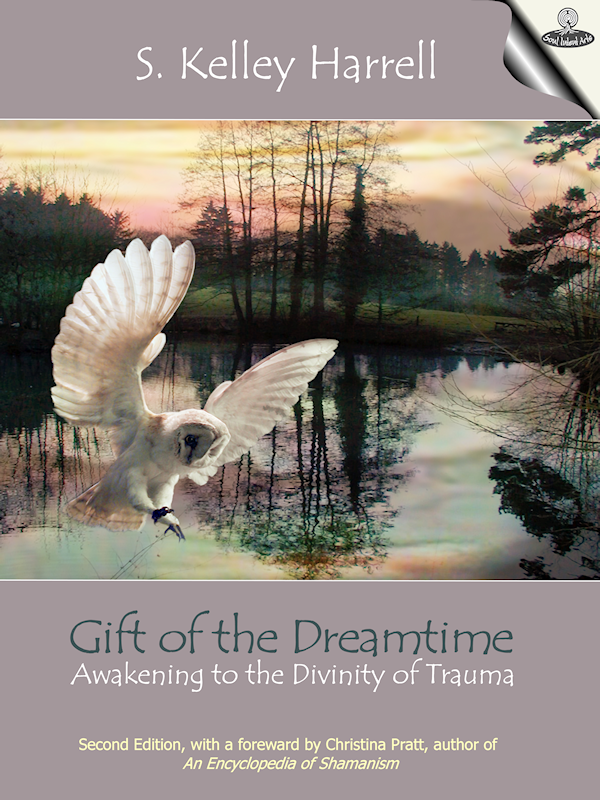 Kelley is author of the newly re-released memoir Gift of the Dreamtime, chronicling her pivotal step into the role of modern shaman. Learn more about her writing and work at kelleyharrell.com , and soulintentarts.com. As an SEO Consultant she provides insight to authors, artists, and alternative healing practitioners on web optimization solutions through Indie Spirits Consulting– indiespiritsconsulting.com. With a foreward by shaman and founder of The Last Mask Center, Christina Pratt, the second edition of this fantastical memoir chronicles a modern shamanic journey from pain, to healing and accepting a calling to work as a soul healer of others. Through that rare glimpse into her experiences traversing the spirit world, Harrell’s story becomes the reader’s adventure. Not always easy to read, there are unflinching passages examining hurtful childhood memories, confrontations with overzealous spirit guides, and challenging personal obstacles she must overcome in order to heal.